Overview - Two guys get a billion dollars to make a movie, only to watch their dream run off course. In order to make the money back, they then attempt to revitalize a failing shopping mall. Comedy is very subjective. Actually, comedy is extremely subjective. If one needs further proof of that, look no further than the comedic stylings of Tim Heidecker and Eric Wareheim. Creators of the cult favorite sketch show, 'Tim and Eric Awesome Show, Great Job!,' the pair are known for their insanely bizarre and often surreal style of humor. Though I'm not terribly familiar with their show, I have seen a few episodes in the past, and the duo's sensibilities are definitely an acquired taste. A gleefully crude exercise in low-fi experimentation mashed with an almost Mad Lib-like descent into eerie randomness, the comedians' work simultaneously satirizes and celebrates all things tacky and campy. From parodies of public access programming to bits that truly defy explanation, watching their material is like stepping into an uncomfortably skewed parallel universe seeped in non sequiturs and darkly meaningless absurdity. The plot (yes, there actually is one) follows best friends and filmmaking partners Tim (Tim Heidecker) and Eric (Eric Wareheim). After being given a whopping one billion dollar budget to make a feature length film, they screen the finished movie for the project's investors, the nefarious Schlaaang Corporation. Unhappy with the results, they demand their money back. Broke and out of options, Tim and Eric decide to take over a dilapidated mall in hopes of recouping the capital they owe. Unfortunately, the mall proves to be more than they bargained for, presenting them with a whole slew of new problems. With the Schlaaang Corporation hunting them down, the duo will have to find a way to make their new venture work, or suffer dire consequences. As relatively conventional as that above summary might seem, for the most part, the execution is anything but. This is a strange, strange film. With that said, some might be surprised that the duo actually sticks to their thin narrative pretty closely. The scripting and acting are almost always intentionally cheesy and campy. Every scene seems to be some type of attempt at self-referential parody or a nearly dada-esque exercise in blatantly abnormal behavior. This can lead to a very uneven and tiresome experience, as unusual gag after gag either hit or miss while they frequently (and deliberately) overstay their welcome. For me, I'd say it was about a fifty/fifty split between what worked and what didn't, but I can easily see some viewers simply hating every second (or conversely, maybe loving). There are many instances where one is sort of left wondering if certain scenes are actually supposed to be funny at all. Or maybe the fact that it's intentionally not funny is supposed to be what makes it funny. Or perhaps the fact that it's still not funny, even after intentionally not being funny, is supposed to then make it even funnier. Or the fact that it's still, still not -- oh, screw it, my head hurts. Hmmm, maybe that's the point then. Perhaps getting viewers and pretentious critics like myself to over-analyze the film's bewildering style is the real joke. Well played, Tim and Eric. Well played. While the pair themselves are usually the source of the film's most insane behavior, there are several times when they end up playing the straight men to even weirder secondary characters. Zach Galifannakis, Will Ferrell, John C. Reilly, and Will Forte are all appropriately inappropriate in their supporting roles. The great Ray Wise and William Atherton also show up, and many curiously unusual faces from Tim and Eric's TV series appear as well. Unfortunately, none of the talent involved end up leaving much of an impression. Before wrapping up, I do want to be clear that my lukewarm reaction to the movie is not because I don't like or "get" the filmmakers' style or intentions. In fact, while not ultimately a comedy, it turns out that my own short film, 'Broken Records,' bears more than a few similarities to the duo's uncomfortable, post-modern style and low-fi sensibilities. I do get it. I really get it. I even admire it. Hell, if you actually clicked the above link, it probably now seems hypocritical of me to even criticize it (or any movie, for that matter) -- but, as presented, I just don't think the film always works. Like I said in the opening paragraph, this really is an acquired taste, and though I haven't seen much of the show that spawned this feature, I can't help but feel like the style works a lot better in smaller, concentrated doses. In many ways movies like this sort of defy typical star ratings. I ended up giving it a 2.5, but to be honest I could have easily gone much lower or higher. In a sea of cookie-cutter comedies that are seemingly slapped together on an assembly line, it's refreshing to see comedians who are willing to deconstruct convention in order to form something new (even if that something new can be tiresome and extremely annoying). To its credit, the movie did successfully make me laugh, squirm and cringe -- just not as often as I would have liked. In the end, your enjoyment of the film will mostly come down to whether or not you can appreciate Tim and Eric's "unique" sensibilities. Those who are unfamiliar with their material are not advised to start here (you'd be better off checking out some of their TV work first). Those who are already fans, however, will likely find the twosome's first foray into feature filmmaking to be a flawed but mildly amusing experience. Magnolia Home Entertainment brings 'Tim and Eric's Billion Dollar Movie' to Blu-ray on a single BD-50 disc housed in a keepcase that comes packaged in a cardboard slipcover. Some skippable trailers play upon start up before the disc transitions to an appropriately bizarre menu. The packaging indicates that the release is Region A compatible. Yes, that's right. A movie based on a show that's notorious for its low-fi visuals is getting a 4 star video score. What's even crazier is, I actually considered giving it a 4.5. Presented in a 1080p AVC/MPEG-4 transfer in the 1.78:1 aspect ratio (some scenes are 2.35:1), the movie actually looks pretty damn good. Hell, a few spots are nearly impressive. Shot on the Red One, the digital source is clean and pristine with only marginal instances of noise in a few shots. Detail is actually very strong, and the image has a nice, sharp quality with decent depth (especially the opening parody sequence of a big budget Hollywood production). The color palette varies a bit depending on the scene, but the majority of the film features a pleasing level of vibrancy that offers some nice pop (the duo's fake tans and impossibly white teeth literally radiate from the screen). Contrast levels are high with slightly blooming whites, and blacks remain consistent and deep. With all that said, the actual content of the image remains rather basic and the movie's low budget does shine through. Some intentionally degraded, VHS style commercials are also peppered throughout. Perhaps it was simply my low expectations going in, but I was pleasantly surprised by the strength of the movie's video. It's certainly not mind blowing, but considering the style and tone of the material, the transfer actually more than gets the job done. Much like the video, the included English DTS-HD MA 5.1 track is unexpectedly robust. Deep and occasionally immersive, the mix offers a well rounded audio experience. Optional English SDH and Spanish subtitles are also included. Dialogue is nice and clean throughout with just a very faint hint of crackle in the high end. Imaging and directionality around the soundstage are smooth, and the film is actually home to a fair number of action oriented scenes. The thumping score packs a wide range of distortion free highs and deep, rumbling lows. Surround activity kicks in with appropriate ambiance, enhancing the creepy atmosphere of the run-down mall. Together, the side speakers and healthy bass response effectively bolster the shootouts with whizzing bullets and disperse explosions. The various audio elements remain well balanced. 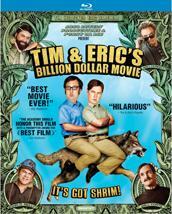 It's not demo material, but 'Tim and Eric's Billion Dollar Movie' sounds quite good. With solid immersion and no glaring problems, there really is nothing to complain about here. Magnolia has provided an entertaining but uncharacteristically conventional (by Tim and Eric standards) assortment of supplements including some deleted scenes, a commentary, and featurettes. All of the special features are presented in 1080p with Dolby Digital 2.0 sound and no subtitles unless noted otherwise. Commentary with Tim Heidecker and Eric Wareheim - The comedy duo sit down for a surprisingly conventional commentary track. That's right, for the most part, the pair actually plays it straight, pointing out genuine production trivia while they discuss the fun they had satirizing bad writing, and the challenges they faced with adapting their style to a feature length film. That's not to say that they don't joke around as well, and thankfully the track is full of several entertaining bits of deadpan humor and bizarre observations. Though much more straight forward than I was expecting, this is a decent commentary and fans will probably want to take a listen. Deleted Scenes (HD, 9 min) - Eight deleted scenes are viewable separately or together. The majority of this material is pretty negligible, but two additional "Understanding Your Movie" bits are kind of amusing and a weird sword commercial featuring Will Forte is actually really funny. Extended Scenes (HD, 18 min) - Three extended scenes are viewable together or separately. The real highlight here is an unedited version of the duo's initial meeting with Will Ferrell's character. In the movie, the scene still feels a bit too long, but on its own, this extended version actually works a lot better and is pretty funny. This might be further proof that the filmmakers' style is simply better suited for shorts and sketches. Good Evening S'Wallow Valley (HD, 8 min) - This is Tim and Eric's version of a fluffy behind-the-scenes promo piece. Intentionally cheesy and filled with relatively useless information (one extra gives a detailed interview about his extremely brief appearance on screen), the featurette is quite entertaining. Interview with Tim and Eric (HD, 22 min) - Presented in 1080i, this is an amusing interview with the filmmakers where they riff off of each other for twenty two minutes. Some of their improvisation can get a little tedious but this is certainly worth a few laughs. HDNET: A Look At Time and Eric's Billion Dollar Movie (HD, 4 min) - Also presented in 1080i, this quick featurette is a complete waste of time. Essentially just a few pieces of the previous interview mixed with some clips from the movie, it's wholly redundant and a waste of space on the disc. Shrim Dance Screensaver (HD) - This is a fake promotional piece advertising "Shrim" that is played on an infinite loop. What is Shrim, you ask? Well, you'll have to see the film to find out. As far as the actual "screensaver" goes, this is basically the stuff of nightmares. Seriously, for whatever reason, I find this clip to be one of the most disturbing things I've ever seen, and just knowing that an infinite loop of it exists on this disc makes it hard for me to sleep at night. Promo Video$ - Five promotional videos are included. They are: "NACA Promo" (HD, 5 min), "In the Can: Sundance Interview" (SD, 11 min), "Gas Attack" (HD, 30 sec) "Godfather" (HD, 30 sec), and "Sad" (HD, 30 sec). The last three are just quick promo spots that ran on TV, but the first two are a bit more substantial. The "NACA Promo" plays out like a sketch from Tim and Eric's show, and the Sundance Interview features more entertaining improv from the comedic duo (a bit involving the film 'Rango' is quite funny). Posters (HD) - A gallery of four posters is included. Photo Gallery (HD) - Twenty four movie stills are included. Theatrical Greenband Trailer (HD, 2 min) - The greenband trailer is presented in Dolby Digital 5.1. Theatrical Redband Trailer (HD, 3 min) - The film's redband trailer is presented with material that is most definitely not approved for all audiences. Also From Magnolia Home Entertainment (HD) - Five additional trailers for other Magnolia release are included. 'Tim and Eric's Billion Dollar Movie' is a bizarre descent into a comedic nightmare world full of idiotic absurdity and surreal, goofy banality. Unfortunately, as striking and original as the duo's approach can be, the movie proves to be too uneven and tiresome to truly succeed. While I can't really compare the film to the pair's previous show, it really seems like their style is just better suited for sketches and shorts. The video transfer and audio mix are both surprisingly strong, presenting a more than capable viewing and listening experience for the modest content. Supplements are solid, with a few entertaining interviews and excised bits. If you're new to Tim and Eric, then I must advise you to stay away from this disc. Fans of their material, however, will probably want to take a look. Now, if you'll excuse me, I need to try and purge that Shrim screensaver from my mind.